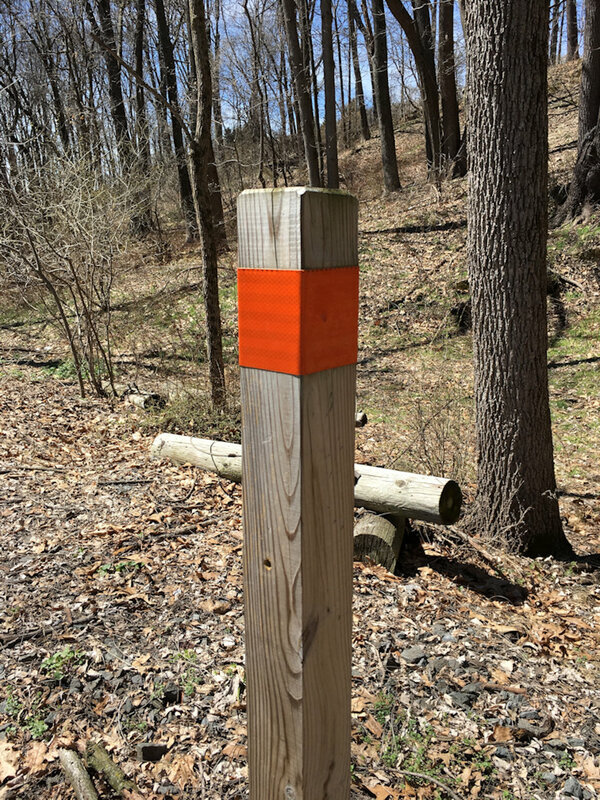 Six (6) foot high rectangular wooden posts are installed every ½ mile along the western side of the trail. 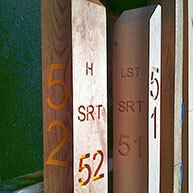 The posts are routed with designations for the municipality, the trail name (SRT) and the mile designation (51 ½ for example). The mile designations have been borrowed from the historic milepost designations (0-60) that were utilized by the North Penn Railroad and then by SEPTA for trains running the 60 miles of track from Bethlehem to Philadelphia. Beginning at the SRT’s northern most point and proceeding southward toward the current end, below listed are the approximate locations of the wooden posts identifying physical trail distances. Bear in mind that the numbers used are historically significant in that they are the same mile markers numbers used on original North Pennsylvania Railroad survey maps. These numbers serve two purposes. They identify mile and half-mile distances (#53-Bachman Street is five miles distant from #48- Upper Saucon Park) and from a different and larger perspective, that #53 is fifty-three miles distant from the rails original starting point, the Union Station location in Philadelphia, PA.
#52 ½ – located in Hellertown Borough approximately 900 feet north of Water Street. #52 – located in Hellertown Borough approximately 600 feet north of Walnut Street. #51 ½ – located in Lower Saucon Township approximately 275 feet north of Meadows Road. #51 – located at the Old Mill Road crossing in Lower Saucon Township. #50 ½ – located approximately 250 feet south of Bingen Road bridge in Lower Saucon Township. #50 – located in Upper Saucon Township, just south of the Lower Saucon/Upper Saucon border. #49 1/2 – located approximately 300 feet south of the Spring Valley Road crossing. #48 1/2 – located approximately 250 feet south of the Landis Mill Road crossing. 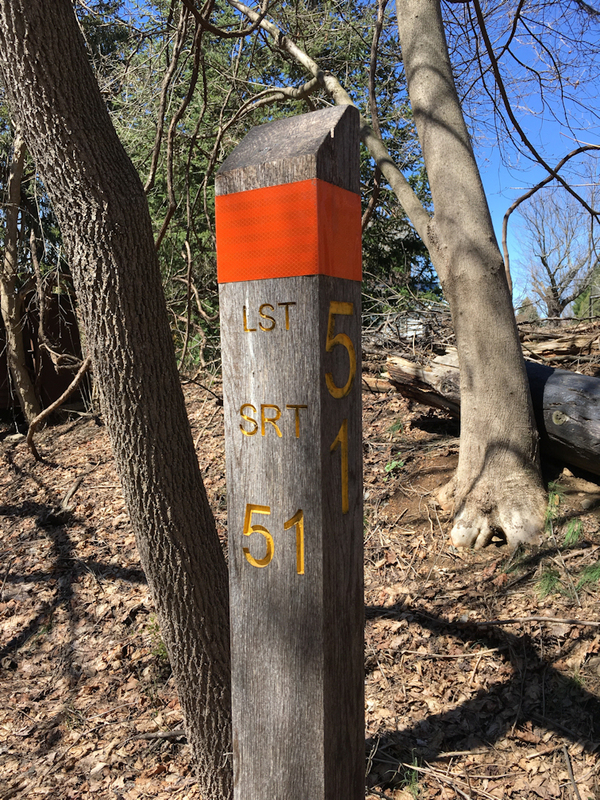 #48 – located inside of Upper Saucon Park across the driveway from the snack stand. These posts augment the physical location identification system in the event of an emergency. 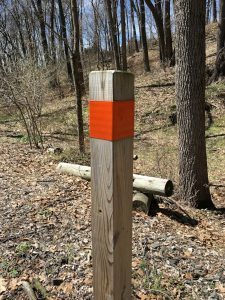 (For example, a trail user who cannot determine which mile marker they are near can notify 911 that they are in the “green” section of the trail and 911 will know they are on the Hellertown portion of the trail). Additionally, traditional green street signs are posted at most road crossings.